Shrewsbury – The Shrewsbury Woman’s Club recently presented $1,000 scholarships to Shrewsbury High School 2018 seniors at during an event held at the Cyprian Keyes Golf Club, in Boylston. 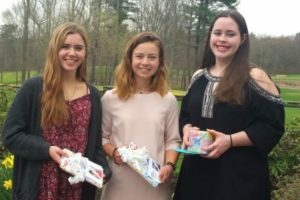 Scholarship recipients from left to right: Kara McSweeney, received $1,000 from the Ann Marie Moreschi Scholarship; Lauren King, received $1,000 from the SWC General Scholarship; and Reilly Brenner, received $1,000 from the Mary Griffin Scholarship. Next articleBig Papi is coming to Julio’s Liquors!